Gauge: The gauge is not very important for this pattern, but one star from point to point is about 2 inches across. Pattern Note: Pattern is worked up in one piece and can be made as long as you wish. Rnd 1: Ch 4, join in first chain to form a ring, ch 1, work (sc into ring, chain 5) 5 times. Repeat in each ch- 5 sp around, join to beginning ch 1. Ch 3, sc in next ch-2 sp. Chain 5, sl st in 4th chain from hook, chain 1 and turn. Rnd 1: Work (sc into ring, chain 5) 5 times. Join in first sc. (5 sc and 5 chain- 5 sps). Rnd 2: Work as Rnd 2 of first star. 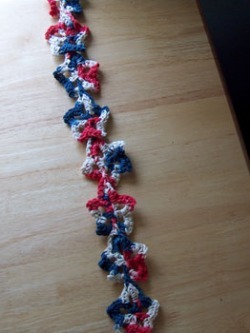 Rep from * making as many stars as needed for desired length of scarf. Fasten off after last star. With yarn needle weave in loose ends.